Investigators can submit study ideas as a concept or full proposal. 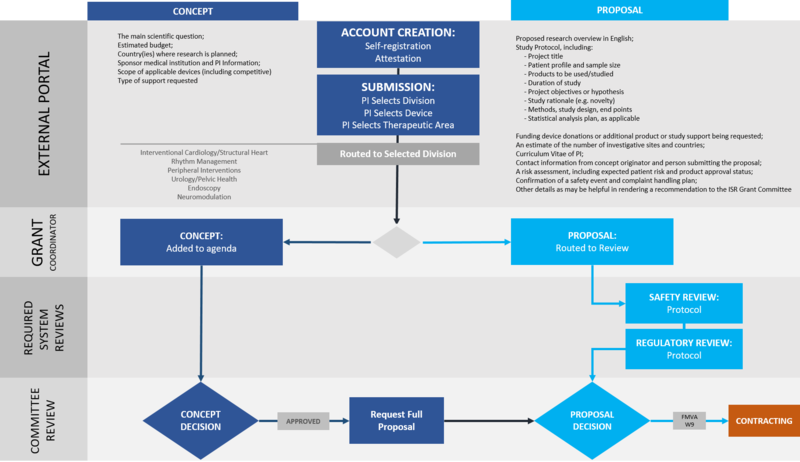 A Concept or study idea includes a short, high-level summary of the study’s Main Scientific Question including therapeutic area, application of product or protocol, an estimated budget and research design setting details. A full Proposal submission details the study including a line item budget, a curriculum vitae of the principal investigator, and a fully developed protocol with objective, design, procedures, analysis plan, adverse event reporting, and safety plan as needed. With this information, the Research Committee will determine whether or not Boston Scientific would like to explore the proposed study idea. To submit a concept or proposal, please create an account or create a new submission if you have an existing account.